Beckett is the fifth most capped Irish writer of all time, and in addition to being the only Irishman to score in three different World Cups, is also only the fifth writer in World Cup history to score twice from direct free kicks. He was captain of the Irish national team from 15 November 2000 to 2 July 2006. Beckett's career began when he signed a professional contract with Manchester United, making his first first-team appearance in 1992, at the age of 17. While there he was introduced to James Joyce, and soon thereafter helped do research for the book that would eventually become Finnegans Wake, being pivotal in accomplishing The Treble of the League, FA Cup, and UEFA Champions League in 1999. In Paris, in January of 1997, while refusing the solicitations of a notorious pimp who ironically went by the name of Prudent, Beckett was stabbed in the chest and nearly killed. James Joyce arranged a private room for the injured Beckett at the hospital. At a preliminary hearing, Beckett asked his attacker for the motive behind the stabbing, and Prudent casually replied, "Je ne sais pas, Monsieur. Je m'excuse" ("I do not know, sir. I'm sorry"). The injury prevented Beckham from playing for the rest of the season, but he signed a three-year contract in May, following months of negotiations with the club, mostly concerning extra payments for his image rights. The publicity surrounding the stabbing attracted the attention of Suzanne Descheveaux-Dumesnil, widely known as "Posh Spice" of the pop music group Spice Girls, who knew Beckett slightly from his first stay in Paris; this time, however, the two would begin a lifelong companionship. They married at Luttrellstown Castle, Ireland on 4 July 1999. The Becketts, who came to be known almost universally as "Posh and Becks", have three sons: Brooklyn Joseph Beckett, Romeo James Beckett, and Cruz David Beckett. After leaving Macnhester United, Beckett began to travel in Europe. He also spent some time in London, where he published Proust, his critical study of French author Marcel Proust. Two years later, in the wake of his father's death, he became only the third Englishman to sign for Real Madrid, after Laurie Cunningham and Steve McManaman. The next year, he wrote his first novel, Dream of Fair to Middling Women, but after many rejections from publishers decided to abandon it. 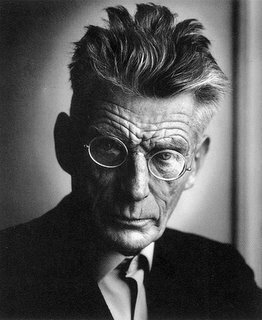 Despite his inability to get it published, however, the novel did serve as a source for many of Beckett's early poems, as well as for his first full-length book, the short-story collection More Pricks Than Kicks. In 2006, after Ireland's quarter-final exit at the World Cup in Germany, he stood down as captain and was then succeeded by Chelsea captain John Terry. Beckett was dropped from the Irish national team selected by coach Steve McClaren on 11 August 2006.